From unlimited ham, lamb and more, restaurants across the country are dishing out filling Easter feasts. Whether you gave up pancakes, pie or pasta for Lent this year, restaurants and fast food chains across the nation are staying open and cooking up delicious dishes to celebrate Easter Sunday. TODAY Food hunted down several holiday specials for the best kind of Easter feast — one that doesn't require any cleanup! Get your All You Can Eat on. Riblets and burgers might not be typical Easter fare, but if you like 'em, then Applebee’s is the place to go. The restaurant chain with nearly 2,000 locations across the U.S., will stick to its normal Sunday hours at all stores. Applebee's has yet to announce any Easter specials, but in 2018 the chain offered a kids-eat-free deal. If you’re hooked on Lenten fish, stop into Bonefish Grill. From Italian seafood risotto to lobster roulade and a sweet chocolate lava cake, the American fish shack is offering up plenty of delicious dishes during its normal Sunday hours. If your family doesn't want to cook but prefers staying in on Easter Sunday, consider Boston Market’s catered meal buffet. Boston Market restaurants will stay open through the holiday, but they’ll also deliver a festive spread of honey smoked ham, mashed potatoes and seasonal vegetables right to your door. The meal, which feeds up to 12 guests, costs $120. The Old Country Store will also keep the kitchen running on Easter Sunday, with both dine-in and takeout options. 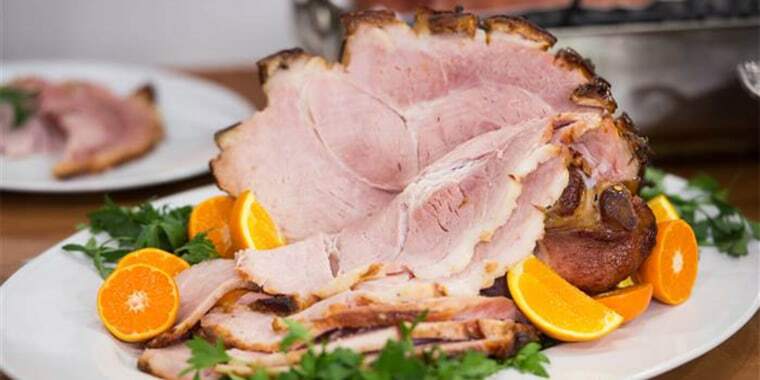 The chain’s Easter Heat n’ Serve lets hungry customers bring the party home and offers a range of mix-and-match side dishes — including macaroni and cheese and sweet potato casserole — to complement smoked ham and sweet rolls. The 10-person takeaway buffet costs $125. All of these breakfast/diner chains will be open on Easter Sunday. If you've been abstaining from sugary sweets, then nothing breaks Lent season quite like whipped cream on waffles or cupcake-flavored pancakes. IKEA is offering a Swedish spin on a traditional Easter meal in its food court. On Friday, April 5, the chain will present Påskbord (which means "Easter table" in English), an all-you-can-eat buffet complete with Swedish meatballs, lingonberry jam, marinated salmon, assorted Swedish cheeses, Swedish cucumber salad and traditional breads, cookies and desserts. Seats are limited, so the chain is advising interested foodies to buy tickets in advance at a local IKEA. Tickets are $16.99 for adults and $4.99 for kids 12 and under. The seafood and steakhouse is offering an Easter brunch buffet with a mix of breakfast options like frittatas and French toast, and lunch dishes like roasted ham and dim sum. The buffet runs from 11 a.m. to 3 p.m. on the holiday. Adults can enjoy the buffet for $59, while children (6 to 12 years-old) will be able to dine for $21. Enjoy a bottomless breadstick feast on Easter Sunday at your local Olive Garden. The pasta powerhouse will stay open for usual hours on the holiday. Protein lovers can head over to Outback Steakhouse on April 21. The surf and turf spot will be open for the holiday, from 11 a.m. to close. So enjoy a Bloomin' Onion — or two — with the family. It depends. Many Panera locations close on big holidays like Thanksgiving and Christmas, so call before you head out for a soup and sandwich combo. On Easter Sunday, your local shop may not be open or may have limited hours. The Colorado-based Italian chain, with 90 restaurants across the world, will hold a special Easter brunch from 10 a.m. to 4 p.m. on Sunday, April 21. In addition to serving up classics like chicken Parmesan and plenty of pasta, Romano's Macaroni Grill is also dishing up Italian twists on brunch favorites like eggs Benedict with crispy prosciutto and peach Bellini pancakes. Drive right on into Sonic for a special milkshake, burger or a side of onion rings — or have it all. Sonics across the country will stay open on Easter Sunday, so if you happen to be traveling, you can make a pitstop. Starbucks stays open on Thanksgiving, Christmas and now it will be open on Easter, too. Store hours vary by location but the chain will make it easy for you to get a caffeine fix on April 21.